I first attempted to make parathas in college, using a recipe from Madhur Jaffrey’s World-of-the-East Vegetarian Cooking. I didn’t have a rolling pin, so I fashioned one out of an empty oatmeal container (I have no idea what I was thinking!) Lacking a skillet, I cooked my poorly-shaped parathas in a nonstick pan. The results were barely edible. 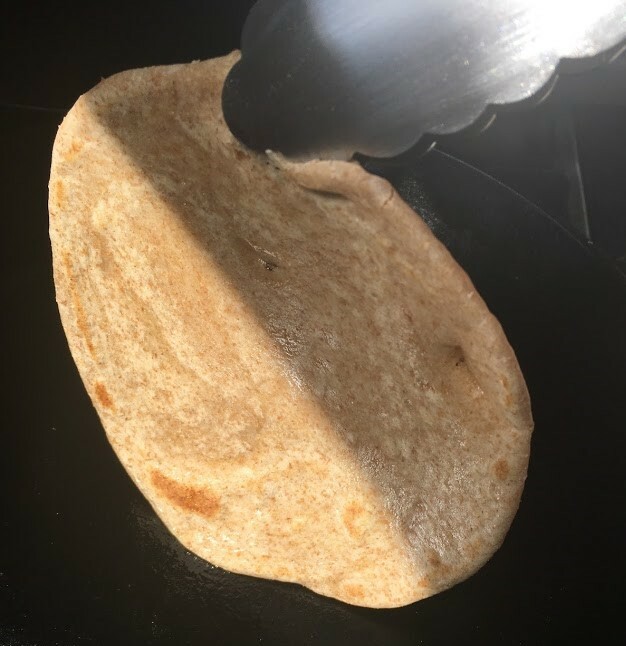 I’ve since improved my paratha-making technique, thanks to an upgrade in kitchen equipment and lessons from my mother-in-law, who grew up eating these every morning in Pakistan. Parathas are traditionally cooked in a curved skillet called a tava. I haven’t purchased one yet, but I find that a cast iron pan works almost as well. The recipe below combines my mother-in-law’s technique with some of the ingredient proportions from Madhur Jaffrey’s recipe. In a medium-sized mixing bowl, combine flour and salt. Add water. Mix together with your hands until a dough comes together. On a lightly floured surface or directly in the bowl, knead until smooth and elastic. Divide the dough into 6 pieces. While shaping a piece of dough, keep the rest covered under a damp cloth so they don’t dry out. 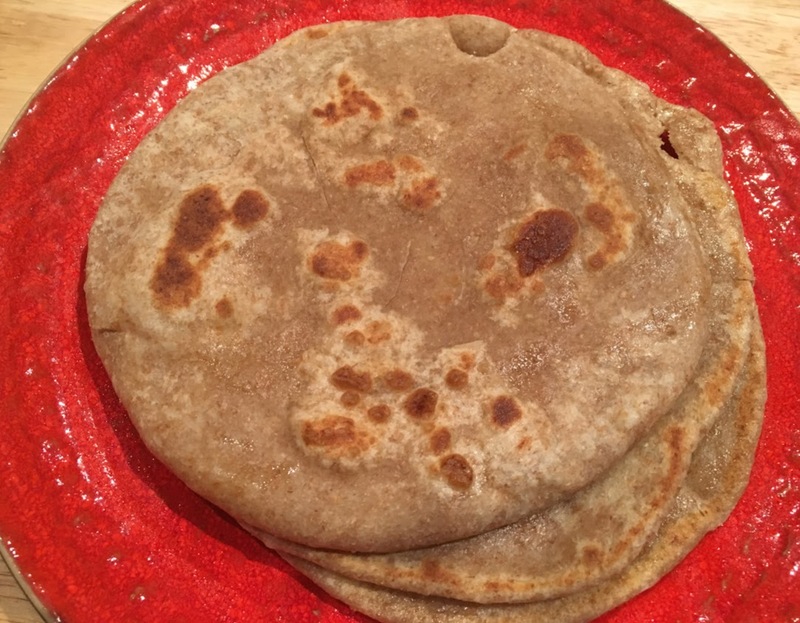 Note: There are several ways to fold paratha dough over itself to create flaky layers. Here is one. Feel free to experiment with other methods, such as this one. Step 1: Using your palms, roll a piece of dough into a ball and then flatten into a disc. With a rolling pin, roll the disc into a circle about 1/8-inch thick. Coat the top of the circle with 1/2 teaspoon of oil, using a pastry brush or the back of a spoon. Step 2: As if making a jelly roll, use your fingers to roll up the dough into a rope. Lengthen the rope by rolling it with your palms. Coil the rope into a spiral, shown below. Be sure to tuck and then pinch the loose end of the rope underneath the spiral. Step 3: Lightly coat both sides of the spiral with flour (this helps it roll out smoothly.) Using a rolling pin, roll the spiral until it forms a flat circle around 1/8 inch thick. Spread 1/2 teaspoon oil on the top. Heat a tava or cast-iron skillet over a medium-high flame. Step 1: Place dough on skillet so that the side spread with olive oil is face down. Step 2: Cook for several minutes until reddish-brown spots begin to form on the bottom, lifting periodically with a fork or pair of tongs to check. The paratha may puff up because of steam trapped between the layers of dough. Step 3: Spread 1/2 teaspoon olive oil on the top of the paratha, and then flip over, cooking until reddish-brown spots begin to form on the other side. Remove and wrap in tinfoil to keep warm until all the parathas have cooked. Serve warm, with an Indian omelet, jam, or jeera aloo (potatoes seasoned with cumin seeds.) For more ideas, click here. Wrap any leftover parathas in tinfoil and refrigerate.